Image registration is the process of aligning two or more images of the same scene. This process involves designating one image as the reference image, also called the fixed image, and applying geometric transformations or local displacements to the other images so that they align with the reference. Images can be misaligned for a variety of reasons. Commonly, images are captured under variable conditions that can change the camera perspective or the content of the scene. Misalignment can also result from lens and sensor distortions or differences between capture devices. Image registration is often used as a preliminary step in other image processing applications. 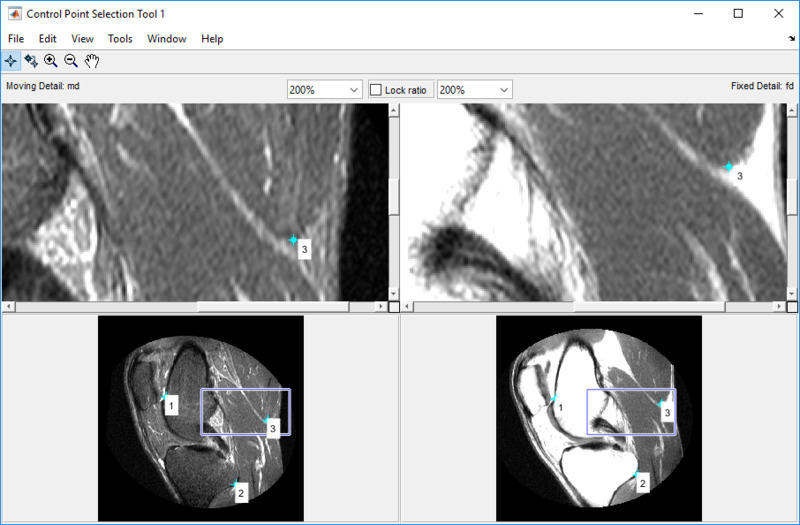 For example, you can use image registration to align satellite images or medical images captured with different diagnostic modalities, such as MRI and SPECT. Image registration enables you to compare common features in different images. For example, you might discover how a river has migrated, how an area became flooded, or whether a tumor is visible in an MRI or SPECT image. 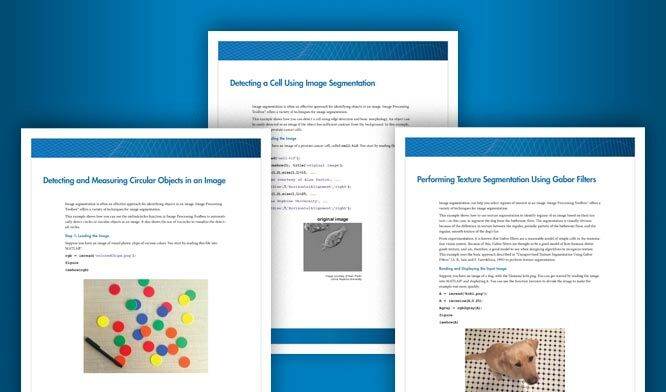 Image Processing Toolbox™ offers three image registration approaches: an interactive Registration Estimator app, intensity-based automatic image registration, and control point registration. Computer Vision Toolbox™ offers automated feature detection and matching. Registration Estimator app enables you to register 2-D images interactively. You can compare different registration techniques, tune settings, and visualize the registered image. The app provides a quantitative measure of quality, and it returns the registered image and the transformation matrix. The app also generates code with your selected registration technique and settings, so you can apply an identical transformation to multiple images. Registration Estimator app offers six feature-based techniques, three intensity-based techniques, and one nonrigid registration technique. For a more detailed comparison of the available techniques, see Techniques Supported by Registration Estimator App. To register images using an intensity-based technique, use imregister and specify the type of geometric transformation to apply to the moving image. imregister iteratively adjusts the transformation to optimize the similarity of the two images. Alternatively, you can estimate a localized displacement field and apply a nonrigid transformation to the moving image using imregdemons. You want to prioritize the alignment of specific features, rather than the entire set of features detected using automated feature detection. For example, when registering two medical images, you can focus the alignment on desired anatomical features and disregard matched features that correspond to less informative anatomical structures. Images have repeated patterns that provide an unclear mapping using automated feature matching. For example, photographs of buildings with many windows, or aerial photographs of gridded city streets, have many similar features that are challenging to map automatically. In this case, manual selection of control point pairs can provide a clearer mapping of features, and thus a better transformation to align the feature points. Control point registration can apply many types of transformations to the moving image. Global transformations, which act on the entire image uniformly, include affine, projective, and polynomial geometric transformations. Nonrigid transformations, which act on local regions, include piecewise linear and local weighted mean transformations. Use the Control Point Selection Tool to select control points. Start the tool with cpselect. Automated Feature Detection and Extraction (Computer Vision Toolbox) detects features such as corners and blobs, matches corresponding features in the moving and fixed images, and estimates a geometric transform to align the matched features. For an example, see Find Image Rotation and Scale Using Automated Feature Matching. You must have Computer Vision Toolbox to use this method. The Registration Estimator app offers six feature-based techniques to register a single pair of images. However, the app does not provide an automated workflow to register multiple images.